Superb performance with unbelievable range. 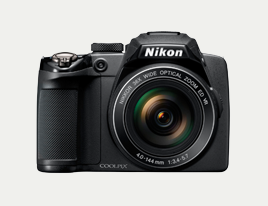 The 36x zoom NIKKOR lens for the COOLPIX P500 features an ED glass element, 22.5 mm wide-angle to 810 mm super-telephoto* coverage, as well as a new side-mounted zoom control for stable handling. Versatile reach and range is further enhanced by a 7.5 cm (3-in.) vari-angle 921k-dot (approx.) high-resolution Clear Color Display that can be tilted as much as 90 degrees upward or 82 degrees downward. 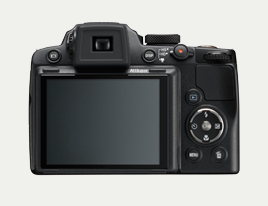 When shooting in the P/S/A/M exposure modes, User Setting mode or Pet portrait mode, a press of the new dedicated continuous shooting mode button allows quick switching from single-frame to continuous shooting at a rapid 8-fps (approx.) for full-resolution (4000 x 3000) images*. Other continuous shooting modes include Continuous H (approx. 60fps/120fps) and the Pre-shooting cache. Helping ensure beautiful pictures at night or in challenging lighting conditions is a 12.1 effective megapixel back illuminated CMOS image sensor that achieves higher sensitivity with lower noise. 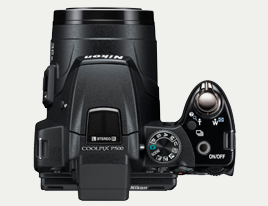 Sensor shift and electronic VR image stabilization also contribute to image quality. 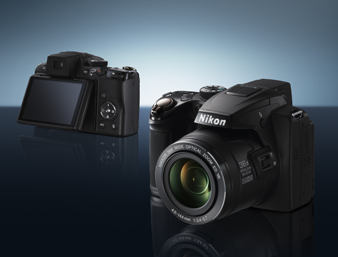 And Nikon's EXPEED C2 dual image processor provides the power to greatly reduce noise and distortion in movies, and to correct for distortion in still images shot at extremely wide angles. Record full 1080p HD movies with stereo sound at the press of a button. 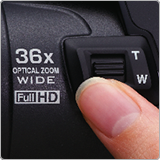 Operate the optical zoom while recording, or save a still image at any time by pressing the shutter button. And the built-in HDMI mini connector with HDMI-CEC support enables output to your HDTV*. * HDMI cable available separately. Note：Images shown on this page are simulated.